Built on the former McClellan Air Force Base in Sacramento, California, IRG is the developer of McClellan Park, a 3,000 acre site and multi-use business park with approximately 8.5 million square feet of commercial business, high technology, and aviation space. The base once supplied major logistical, repair and maintenance support on the West Coast for World War II, The Korean War, The Vietnam War and Operation Desert Shield/Storm. IRG purchased the facility in 2000 and has invested more than $200 million into revitalizing the site. Approximately 230 companies moved to the park, including Northrop Grumman, J.C. Penney, California Department of Transportation, Cal Fire, The US Coast Guard, General Dynamics, and Americorp. These companies are associated with employment for approximately 15,000 individuals. McClellan now includes industrial/office space, air museum, chapel, dormitories, hotel, conference center, recreational facilities and an airport. The property also features premier amenities including a luxury hotel, a full runway, general aviation and commercial aircraft capabilities, and a wide array of hangers. 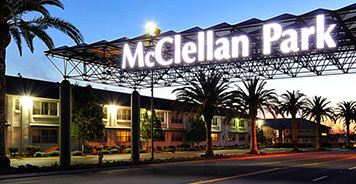 The primary infrastructure for McClellan was funded with more than $100 million in EB-5 investments which experienced full capital repayment. This funding went to sewer replacements and upgrades, environmental cleanup, rehabilitation of former military base structures, new construction, railroad upgrades, street rebuilding, flood control, and other new infrastructure construction and capital improvements. 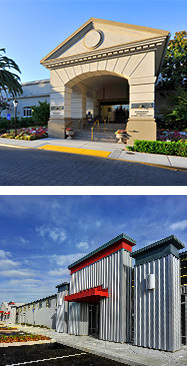 After millions of dollars in renovation and environmental remediation, McClellan Park is now widely considered the national gold-standard for large military base reuse.